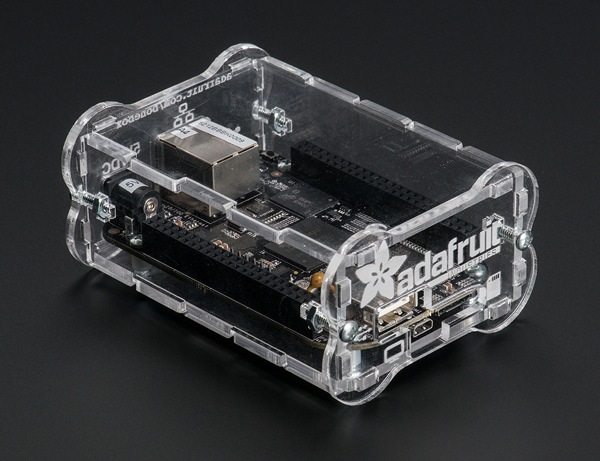 UPDATED PRODUCT – Adafruit Bone Box – Enclosure for Beagle Bone/Beagle Bone Black « Adafruit Industries – Makers, hackers, artists, designers and engineers! 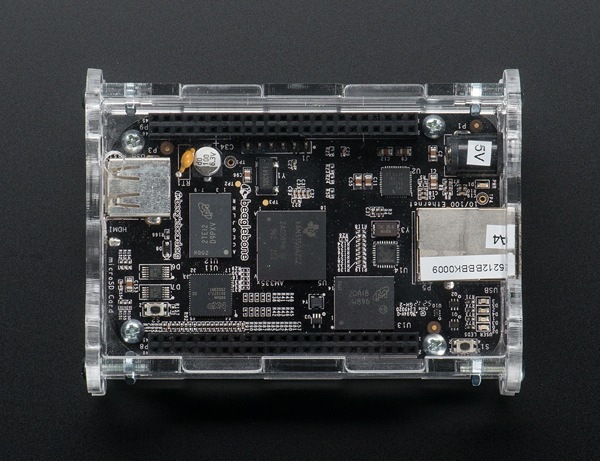 UPDATED PRODUCT – Adafruit Bone Box – Enclosure for Beagle Bone/Beagle Bone Black. Pack up your Beagle Bone or Beagle Bone Black in this lovely clear plastic case. We designed this case to be the ideal enclosure, with plenty of elegant details to make it useful to you! New! As May 2 we are shipping an enclosure that will fit both the original Beagle Bone and has a slot for the HDMI port of a Beagle Bone Black. New! As May 2 we are shipping an enclosure that will fit both the original Beagle Bone and has a slot for the HDMI port of a Beagle Bone Black. The enclosure comes as 6 laser cut acrylic pieces, 4 plastic standoffs, 8 hex-nuts and 8 1/2″ 4-40 screws. Assembly is easy, and requires only a Phillips screwdriver. Once assembled, the box has lovely engraved ends with cut-outs for the DC power, Ethernet, microSD card, USB host and USB debug ports. The ends are even bone shaped – they act as a bumper to keep the attachment screws from scratching your desk. There’s plenty of space inside to add on one of our Beagle Bone Proto Capes with components or connectors soldered on. Fits any Beagle Bone version out there – but not BeagleBoards! It’s easy to put together, check out our quick tutorial.